1913 Bath House Inventory, p. 28, no. 149, in the Red Room, in the 'large glazed case near door - Left Hand Division'. 1914 Wernher Inventory, p. 28, no. 141. The unusual construction, following that used for full size wine and beer casks, is of interest. 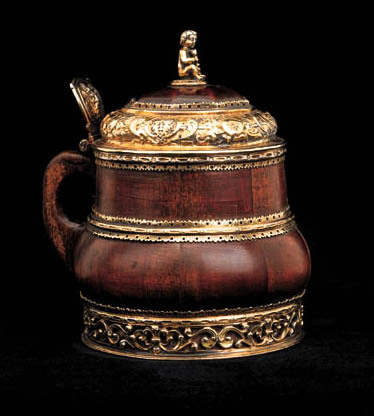 Silver-gilt mounted drinking vessels are usually in the form of beakers such as a fine Swiss example dated 1529 (Christie's, Geneva, 19 May 1997, lot 161).